Read their European Vocational Skills Week summary leaflet for some highlights from the week! It includes more information about the events, award winners and ambassadors. We can't believe #EUVocationalSkills Week 2017 is over!If you missed out, don’t worry: you can see an overview of the events and activities held across Europe in the video below 🎬🎬🎬 Watch, like, share and #DiscoverYourTalent! Vocational education and training can take many different forms and routes. It can cover a vast range of skills from designing clothes to developing apps. Erasmus+ and European Social Fund help thousands of people everyday to transform their lives though VET. Watch the EC’s show-reel of skills successes! Don’t forget you can still share your story about vocational education and training on the website of the European Commission! By sharing your story you will help raise awareness of the wealth of opportunities available through VET and inspire others! Tell them about a traineeship or apprenticeship that helped #DiscoverYourTalent, or how the opportunity to re-skill lead you to a new career. 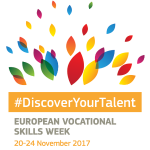 We look forward to seeing you at EU Vocational Skills Week 2018 in Vienna, Austria! This message was sent by the European Commission.